Disclaimer: This interview appeared shortly after the publication of Ilsa Mayr’s novel, The Widow, a book about one woman’s experience of illegal immigration. There are always circumstances that humanize a situation that is fraught with difficulties. This story is imaginary and does not address the reality of the millions of illegal aliens who have crossed the border or overstayed their student/visitor visas. I interviewed Ilsa Mayr about her release before I understood the magnitude of the problem. Good morning, Ilsa. Thank you for agreeing to this interview. I’d like to start with the inspiration for The Widow. You have chosen a controversial idea for your relationship. How did that occur to you? The inspiration for THE WIDOW came from a most prosaic incident. I was sitting in my dentist’s reception room, waiting to have my teeth cleaned. I picked up a magazine that featured a long article on illegal border crossings in Texas. From that evolved the plot of the novel. I can’t remember the name of the magazine, but the article was obviously impressive. Did you have any second thoughts or misgivings about a marriage of convenience for these two characters? I am a sucker for the marriage of convenience plot. Since we know that a happy ending is guaranteed in a romance, one of the thornier problems is to come up with a conflict strong enough to keep the hero and heroine apart for some fifty to seventy thousand words. In a marriage of convenience plot, tension and conflict are naturally built in. You write in two genres. The Widow seems to have elements of both. Which element is most comfortable for you? Lately I’ve been writing a romance, followed by a mystery. I think this keeps me from falling into a rut – or so I hope. And I like to combine the two, at least in a small way, by adding a bit of mystery/suspense to the romance and a hint of romance or possible future romantic involvement to the mystery. Love and danger are a potent combination. What do you like most about this book? The protagonists, Santiago and Jane Peterson, the widow. I think most authors have a strong preference for their characters – over other elements in the story. As a librarian you see a multitude of books vying for space on your shelves. What insights into readers’ preferences have you found to help you with y our own writing? None–I can’t write to demand. I tried it, but can only write what I like to read. For example, right now at school the supernatural/horror is very popular. However, I don’t like to read that genre as I am very impressionable and when home alone in the evening, a small noise can conjure up scary images. You say on your website (www.ilsamayrbooks.com) you began writing after many years as a librarian and the first book you wrote is still in a box, hidden away. What advice would you give to new writers about their first attempts? Probably to keep first attempts in the closet. However, it is possible to use the plot or characters later in a new book. I glad you said that! Was this first attempt a romance or a mystery? It was a young adult novel–a very hard genre to break into. Have not tried to write in that genre again. Maybe I’ll go back to it, but right now I have a number of plots that bug me to use them. Pesky things, ideas. I can understand that! Do you have an overall theme that inspires your creative efforts?None that I’m aware of. Themes are a difficult topic. The students at school always find the term “theme” scary. Often themes are so subtle that they are difficult to unearth. To make matters worse, there can be more than one theme in a novel. I’ve noticed that several of your books have artistic elements: in Maelstrom and Serenade music is an element; dance is important in Dance of Life; and painting is significant in Portrait of Eliza. (I will include thumbnail covers for some of these). Will you elaborate on how ‘art’ influences your work? Probably because these are areas that I love. We drive to Chicago several times a year for the Chicago symphony. Usually we (my husband and I) go early so that we can visit the Art Institute which is across the street from Symphony Hall to see the new exhibits or just go to look at our favorite ones again. In what ways, if at all, did the novels of Zane Grey influence your work, especially The Widow and Gift of Fortune? Having grown up in Austria, where every 3-4 kilometers there’s another village or town, the idea of wide open spaces where there’s nothing but open fields and grassland is awesome. To most Europeans, or to those of us who have European roots, the Old West, or the myth of it, is totally fascinating. Among movies, a Western is my favorite genre. Right now hardly any are filmed, to my dismay. You write both romance and mystery. Dance of Life was your first published novel and had elements of mystery as well as romance. 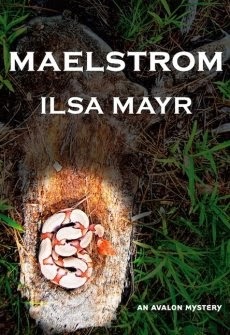 Maelstrom is a mystery and, according to one reviewer, has ‘an agreeable romantic subplot’. Do these genres provide a pleasant, natural mix for you or do you lean more toward one? Right now my favorite mix is a mystery with a romantic subplot. I suppose “romantic suspense” is the right term. The last time I approached a librarian about genre fiction, she was quite dismissive and made me feel I was a lower form of life. Do you find any difficulty in combining your profession as a librarian with you work as a romance/mystery writer? I am so sorry you ran into that kind of librarian! The snobby attitude is totally outmoded. My idea is that ANY reading is better than NO reading. I think of a student’s reading as stepping stones–the “easy” books leading to more reading, leading to more difficult and challenging reading. I love it when a student tells me that a particular book is the one he/she (it’s usually a he) has read cover to cover. And asks if I have another one like it! That’s when I feel I’ve earned my pay. That is a wonderful feeling, may you have many more of them, especially for your own books. Thank you so much for taking this time from your busy schedule.